A multi-million dollar subdivision development has been carried out by the Pukaki Airport Board on behalf of the Mackenzie District Council. Income from section sales will fund operational expenditure and future development in the Mackenzie Basin district. The District Council’s Aviation Strategy saw the creation of a Public Airfield at Pukaki as paramount. A Special Purpose Airport Zone was prepared in the District Plan to put this strategy into action. Central to this was to have accommodation permitted on the Pukaki Airport airfield. Most other New Zealand airfields do not allow freehold titles on the airfield as Pukaki Airport Development in the Mackenzie Basin does. Originally aimed at aviation businesses, with the “house and hangar” option created later and extended to private aviators. Private aviator’s accommodation area is 150 square metres, with a ground footprint of 75 square metres, with the profile not exceeding the height of the hangar and a Colour Pallet being enforced. 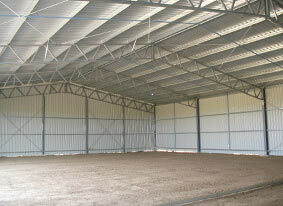 Most hangars are “two storied” with mezzanine space available, providing flexibility and innovative design options to maximize the stunning Mackenzie Basin views – North to Mt Cook and the Southern Alps, West to the Ben Ohau Range, south to the Benmore Range or East across the Mackenzie Basin to the Dalgety and Two Thumb Ranges. Common sense rules for insulation and sound deadening are in the District Council rules for on-site accommodation and to Standard G6 of the Building Code. Further information can be obtained from the Mackenzie District Council. 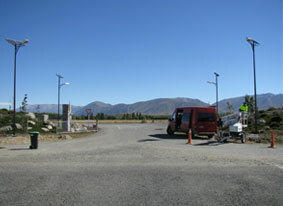 The Pukaki Airport 55 section subdivision includes sealed access roads, underground water, sewer and power, and the communications cables link to the Twizel Telephone Exchange with Broadband capability. Internal taxiways are 10m from section boundaries to allow aircraft to pull out of their hangars but not block any taxiway. With the 10m sealed taxiway, and a further 10m either side, there is ample distance between facing buildings. Unsealed helicopter clearways have a width of 50m between the property boundaries. Side boundaries of 3m were established for separation between adjoining properties while a further setback off the access roads provides for parking. Discrete solar powered lighting bollards mark the entrance to each of the access roads, which have been named after pioneer aircraft used in the Mackenzie Basin (Auster Ave, Swallow Drive, Pipe Place, de Havilland Dr, Dakota Drive, Avro Ave etc). The main internal access road is named after aviation pioneer Sir Harry Wigley. Pricing for these freehold sections has been established recognizing the cost of residential sections in nearby Twizel. When first placed on the market, demand was so high the initial single stage subdivision was immediately increased to four stages (33 sections) and then a further two stages ( 5 and 6) with another 20 sections was developed south of the new main entrance. 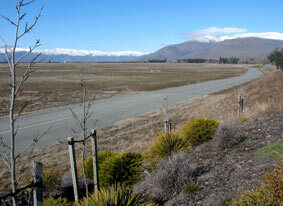 The advantages of having a freehold title to land on an airfield compared with a lease were obvious to many purchasers who saw the opportunity to have a base for their aircraft, (or even boat and car) to enjoy the summer and winter recreational opportunities in the Mackenzie Basin and Waitaki Valley. With all services available here at Pukaki Airport development, what a fantastic idea. There are a limited number of sections remaining in the initial stages at $85 per square metre, and those in Stages 5-6 range between $90 to $95 per square metre with members of the Pukaki Airport Board carrying out the sales. Current owners are a mix of Commercial and Private aviators.